Background: What is Dissociative Identity Disorder? 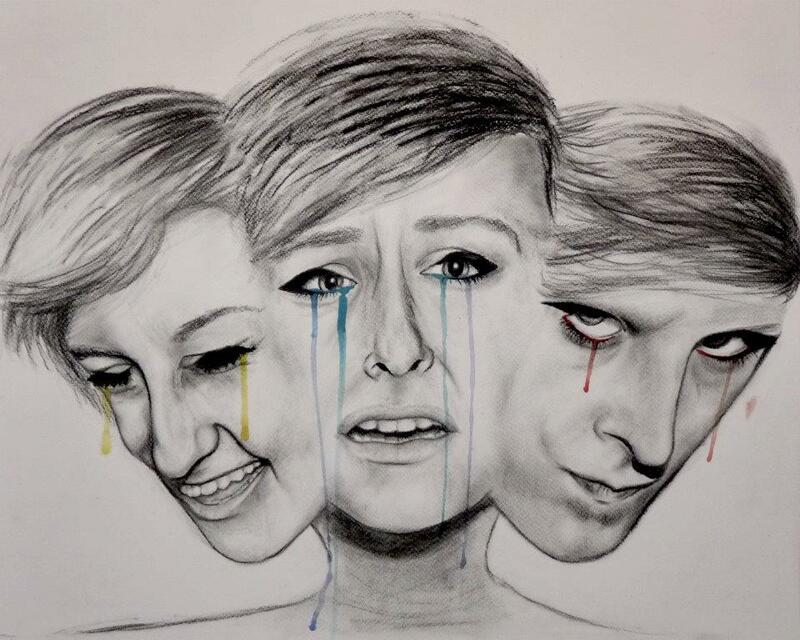 Dissociative Identity Disorder, once known as Multiple Personality Disorder, is defined as a disorder in which two or more distinct personalities coexist and oftentimes fight within the same individual. It is not a form of schizophrenia, which we have talked about before on this series. While it is also a neurotic disorder, it does not deal with the connection with understanding reality, which is a major symptom of the psychosis labeled as schizophrenia. Who Were Thigpen & Cleckley? 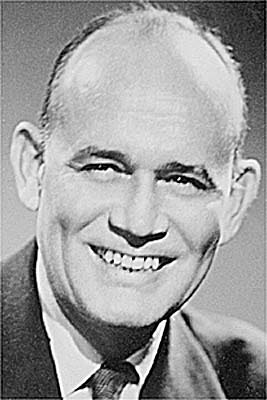 Dr. Corbett H. Thigpen (who lived from January 8, 1919 – March 19, 1999) was an American psychiatrist and the co-author of the popular, nonfictional book The Three Faces of Eve, which was first published in 1956. 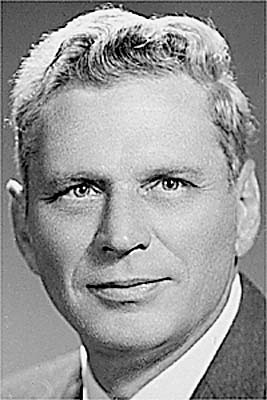 Hervey Milton Cleckley (who was born sometime in 1903 and died on January 28th, 1984) was also an American psychiatrist and one of the leading pioneers in the field of psychopathy. His famous book, The Mask of Sanity, provided one of the most influential clinical descriptions of psychopathy as seen by the expansion and modernization of modern psychology in the twentieth century. He claimed that a psychopath could appear normal and engage in normal society, but deep behind the “mask” was the world of the mental disorder. 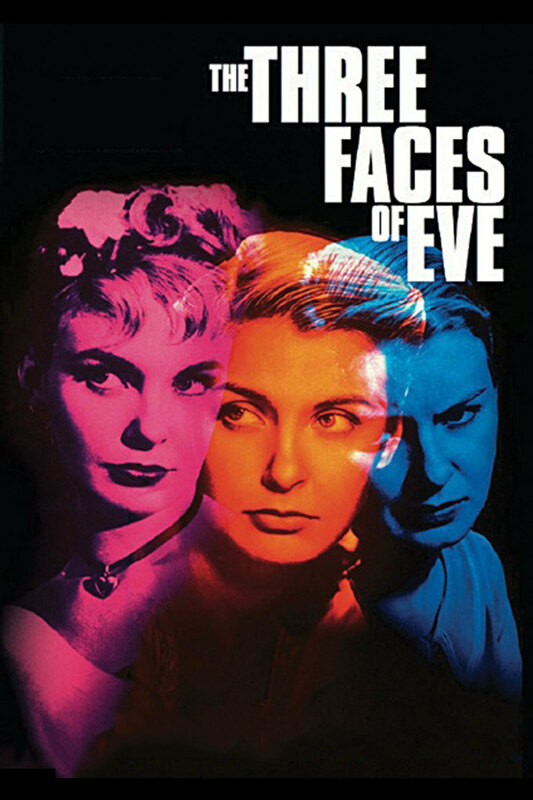 While he did in fact write his Mask of Sanity in 1941, he is most known for his involvement of the 1954 case study of a female patient labeled as Eve, which would later become the book The Three Faces of Eve in 1956, which he co-wrote with his psychiatric partner Corbett Thigpen, and the movie of the same name in 1957. Thigpen and Cleckley’s reports and case studies re-popularized the controversial and little-understood diagnosis labeled as multiple personality disorder. Although Thigpen and Cleckley didn’t originate the ideas, they popularized them and the idea of individual differences in psychology. Throughout her interviews, several emotional difficulties revolving around her life were revealed. Thigpen and Cleckley, the psychiatrists, believed that she had a large number of complex yet commonplace martial and personal conflicts. They were intrigued that Eve had no recollection of a recent trip she had taken with her husband, which they had been informed of through Eve’s phrasing of amnesia. Interested enough, they used hypnosis in an attempt to call the memories back. The amnesia, while Eve was under hypnosis, suddenly cleared. Several days later, a letter from Eve While arrived at Thigpen’s office. 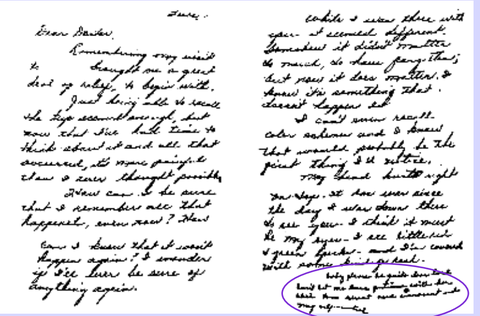 The letter concerned her therapy and started off in her usual calligraphic handwriting, but ended with a childlike scrawl. Confused, the psychiatrists brought up the letter to Eve during her following visit. She denied sending it, but did admit she had begun one – one she never finished and thought she had thrown away. During that interview, Eve White (who was normally considered a very self-controlled, introverted, and the picture perfect model of the “conservative 1950’s woman”) became increasingly distressed and asked if hearing an occasional voice made her clinically insane. She seemed incredibly stressed and desperate for answers. The therapists took notes. Eve White was no longer the quiet girl she had been during her first interview. She had different physical movements – instead of shyly sitting in her chair she swung her legs across each other. Her gestures and eye movements became frisky – much more lively and passionate than those of Eve White’s personality. When asked her name, she immediately replied that she was “Eve Black”. The therapist noted that this new mindset had a “childish daredevil air, an erotically mischievous glance, a face marvelously free from the habitual signs of care, seriousness and underlying distress.” Her voice and language structure had evolved into the complete opposite of what she had shown in previous meetings, and the therapist began to think of her as an entirely different woman. Over the next 14 months, Eve White/Black was interviewed for around one hundred hours. Thigpen and Cleckley discovered that although Eve Black could appear out of nowhere, she could only be “called out” to the world when Eve White was under hypnosis. It was also confirmed that Eve White couldn’t be “brought back” unless Eve Black was under hypnosis. After several sessions, the hypnosis was no longer needed for obtaining changes, but it began to complicate Eve White’s life as Eve Black began to find it easier to “take over” using amnesia and mind-splitting headaches. Thigpen and Cleckley believed that Eve Black had enjoyed an independent life since Eve White’s early childhood. They uncovered a number of incidents during Eve White’s childhood where she engaged in acts of disobedience and total mischief in which she was not aware of what was happened and punished for. Some of these incidents were backed up in later interviews which were conducted with her mother, father, and husband. Since Eve Black was able to take over much easier than before, she avoided family and close friend. She sought the company of strangers and was able to remain unrecognized by imitating the characteristics of her counterpart. Both of these personalities were then given two psychometric tests. An intelligence quotient, more commonly known as an IQ, is a score derived from one of several standardized tests designed to assess human intelligence. Eve White obtained an IQ of 110 and Eve Black obtained an IQ of 104. 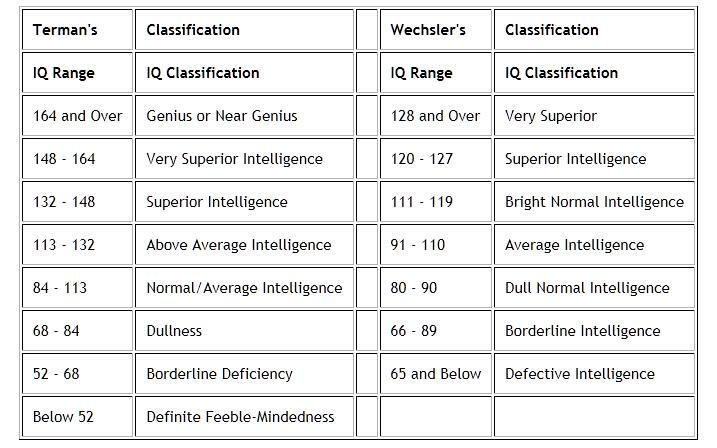 While both of these scores fall into the category of “average/normal intelligence”, Eve Black scored six points lower. Next, the two personalities were asked to take the Rorschach Test, which is a a type of psychoanalysis exam in which a standard set of symmetrical ink blots of various shapes and colors are presented one by one to the subject, who is asked to describe what they suggest or resemble. Eve Black was labeled as regressive, while Eve White was repressive. White showed obsessive-compulsive traits and an inability to deal with her hostility. Black showed sexual obsession. The therapists noted that Eve Black had “often misled the therapist into believing she was cooperating, when in fact her behavior was particularly detrimental to Eve White’s progress.” The therapists began noting that Eve Black showed little compassion and was not easily persuaded to help with the therapy. As Eve White became aware of Eve Black’s existence through the long and drawn out interviews and tests, she began being repressed by her other personality. After eight more months of treatment, Eve White seemed to finally make progress. Her “blackouts” ceased after Thigpen and Cleckley begged Eve Black to help. She began increasing her performance at her job, which was being a telephone operator. It seemed to look like she was reaching acceptable and reasonable solutions to her marital problems. However, therapy and treatment continued. Eve White’s headaches returned and so did her periods of amnesia. Eve Black denied all responsibility and began reporting the same experiences. Eve White’s state of mind deteriorated rather quickly, and it got to the point where Thigpen and Cleckley considered ending the case study and confining her into a mental asylum for the rest of her life. It became too easy for the therapist to call up whichever personality he wanted to examine, and childhood experiences literally gushed out of her mind as she was investigated under hypnosis. 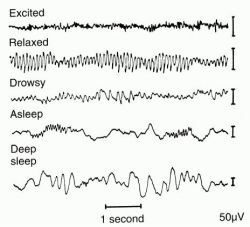 After Jane appeared, the three personalities were given electroencephalogram (EEG) tests. It was possible to see a clear distinction between the brain scans and readings of Eve Black and the other two personalities, however it was not possible to see a clear distinction between Eve White and Jane. Having been able to work with the three personalities (Eve White, Eve Black, and Jane), for several more months, the therapists concluded that Jane could take possession of the entire body and regain full health, leading her way to a happy life. Jane had awareness of both Eves’ thoughts and behaviors but had no access to their memories prior to her “creation.” Jane had learned to take over Eve White’s tasks at work and home and showed dedication and compassion for her daughter. However, although the therapists could work with Jane to determine whether Eve Black had been lying, Jane was unable to find a way to displace Eve Black or to communicate through her. So, in short, Jane was aware of Eve Black and Eve White. Eve Black was aware of Eve White. Eve White was, for the majority of the time, unaware of both Eve Black and Jane. It was decided that Jane was the most stable of the three personalities and was the most likely solution to the battlefield inside Eve’s troubled mind. Her growing dominance over the other two personalities seemed to be an appropriate resolution to the problem given to Thigpen and Cleckley to begin with. The book was written, the movie was produced, and the patient received no benefits or reward for either. In 1975, almost two decades afterwards, “Eve” claimed that she had experienced many other personalities before the original therapy and after it. She has recalled a total of twenty-two personalities and suggested that the fragmentation of her personality was a defense mechanism, possibly to protect herself from daily chores she could not bear. 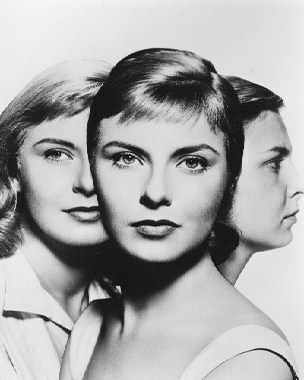 Thigpen and Cleckley were convinced that this would become the prime example of multiple personality disorder, and it did. Although they did not point to an exact cause of the disorder, they brought up the idea that it could be a response to child abuse as a way for the individual to protect him or herself. This case study was useful in revealing the origins of abnormal behavior. It gave a long and detailed history that is used as an aid to understanding and helping clients with the same problems today. The Study of Eve gave an in-depth picture providing rich qualitative data through the interviews and process of hypnosis and also quantitative data through the psychometric tests. Thigpen and Cleckley involved outside sources, such as Eve’s relatives and family, to verify most information and asked independent third party experts to give a variety of tests, including the EGG – which has been considered the strongest piece of evidence pointing towards the argued fact that this disorder exists. Although it is incredibly possible that Thigpen and Cleckley could have been lied to this entire time, it is argued that a falsified performance could not have been continued for so long and consistently. Even today, Multiple Personality Disorder diagnosis are considered very unreliable. For example, there are more cases reported in the United States of America compared to every other country on the planet. This could be because of the fact that American psychiatrists are more likely to pinpoint the disorder on individuals. Interestingly, women are more likely to be diagnosed then men. Perhaps Thigpen and Cleckley actually unwittingly led patients into believing they actually have the condition. Perhaps the monster they discovered was merely a figment of their own imaginations, and the work of a natural actress attempting to get out of her marriage. I came across the original film my by the university while binging on Youtube documentaries and was convinced of her personality disorder. There are a few times I questioned the change of personalities facial expressions but considered them moments of confusion as the next personality suddenly emerged. I have never read the screenplay or watched the movie so I watched without any preconceived notions of what was happening. The long term effects of her multiple personalities covered in this article seems plausible compared to the happy wife and housewife role presented as normal in the original documentary that seemed unlikely.